Kwesi Brew was one of the finest poets of his age. 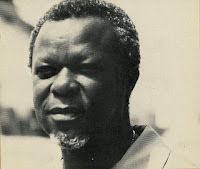 He left a permanent mark on the landscape of Ghanaian poetry, and on the country itself - it is sometimes suggested that "The Sea Eats Our Land" played a significant role in motivating the government to construct Keta's sea-defense system. His death last year at the age of 79 is still being felt by those who were moved by his writing. Born of a Fante family in central Ghana, Kwesi Brew was brought up after the death of his parents by a British guardian who introduced him to books. After his early education in Ghana, Brew was among the first BA graduates from the University College of the Gold Coast in 1951. Later he served both colonial and independent governments in district commissions, and after independence in diplomatic posts in Europe. While still a student, Brew participated in college literary activities and experimented with prose, poetry, and drama; after graduation he won a British Council poetry competition in Accra, and his poems appeared in the Ghanaian literary journal Okyeame as well as several important African anthologies. Shadows of Laughter (1968), a collection of his best early poems, reveals a thematic interest unusual for an African poet: the value of the individual compared with that of society as a whole. In poems such as 'The Executioner's Dream', which views with something like horror some of the rituals of traditional African life, he suggests that society, in an attempt to purge itself of the ills of life, robs the individual of dignity. African Panorama and Other Poems (1981) draws upon the sights and sounds of rural and urban Africa. In his collection Return of No Return (1995), he pays tribute to the American writer Maya Angelou and to Ghanaians who may have helped reshape his Eurocentric views into Afrocentric ones. Kwesi Brew, who has died aged 79, was a Ghanaian public servant and businessman, and one of that talented generation who came to maturity during Ghana's independence 50 years ago. Born of a Fante family which played a distinguished part in his country's history, he spent part of his youth under the guardianship of a British education officer, KJ Dickens, to whom, he used to say, he "owed everything". He was one of the first generation of undergraduates at the University College of the Gold Coast, where he read English and became known for his acting talents. On graduation, Brew was recruited into the administrative service - part of the Africanisation programme to replace the British colonial officers - and was successively assistant district commissioner and then district commissioner, mainly working in the Kete Krachi area. He had to make his way among people who were not used to seeing a fellow African in such a post, but was soon warmly welcomed for his affability and lack of pomposity. Among the challenges he had to face was the imminence of the giant Volta Dam, which was to flood some of the Krachi lands. Brew was recruited to the early Ghanaian diplomatic service and worked in the UK, France, Germany, India and the USSR, before serving as ambassador in Mexico, Lebanon and Senegal. Later, out of sympathy with the politicians of the time, he left public service and went into business, first joining his younger brother Atu and working as resident director of the Takoradi Flour Mills from 1975-81. He then developed his own company, the Golden Spoon Flour Mills, based in Tema. Kwesi Brew was in the tradition of writer-diplomats, producing elegant and elegiac verse. His only internationally published collection was The Shadows of Laughter (1968), but he wrote a compassionate poem on the downfall of Kwame Nkrumah. He is survived by his second wife and three daughters.